The Summer Sanitarium Tour was a music event led by American heavy metal band, Metallica. The first edition took place during the summer of 2000, with 20 shows in the United States. A second edition was held during the summer of 2003, with 21 shows in North America. The tour was sponsored by MTV and Mars Music and promoted by SFX Concerts. Jason Curtis Newsted is an American metal musician, known for being the second bass guitarist with the band Metallica from October 1986 until his sudden departure in January 2001. Powerman 5000 is an American rock band formed in 1991. The group has released nine albums, gaining its highest level of commercial success with 1999's Tonight the Stars Revolt!, which reached number 29 on the Billboard 200 while spawning the singles "When Worlds Collide" and "Nobody's Real". Frontman Spider One is the younger brother of fellow metal musician Rob Zombie. 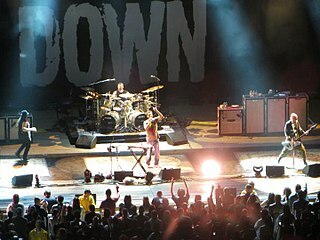 System of a Down is an Armenian-American heavy metal band from Glendale, California, formed in 1994. The band currently consists of Serj Tankian, Daron Malakian, Shavo Odadjian, and John Dolmayan (drums). Limp Bizkit is an American rap rock band from Jacksonville, Florida. Their lineup consists of Fred Durst, Sam Rivers, John Otto, DJ Lethal (turntables), and Wes Borland. Their music is marked by Durst's angry vocal delivery and Borland's sonic experimentation. Borland's elaborate visual appearance, which includes face and body paint, masks and uniforms, also plays a large role in the band's live shows. The band has been nominated for three Grammy Awards, have sold 40 million records worldwide and won several other awards. Linkin Park is an American rock band from Agoura Hills, California. Formed in 1996, the band rose to international fame with their debut album Hybrid Theory (2000), which was certified Diamond by the RIAA in 2005, and multi-Platinum in several other countries. Their following studio album Meteora continued the band's success, topping the Billboard 200 album chart in 2003, and was followed by extensive touring and charity work. "Master of Puppets" / "Welcome Home (Sanitarium)"
Musicology Live 2004ever was a concert tour by American recording artist Prince to promote his Musicology album. The tour began in March 27 in 2004 in Reno, Nevada and concluded on September 11 in San Jose, California. It was a commercial success earning $87.4 million from 77 shows in 52 cities across the United States and selling more than 1.4 million tickets. Prince said one of the goals of the tour was "to bring back music and live musicianship." The No Security Tour was a Rolling Stones concert tour to promote the concert album No Security. The tour spanned over 40 shows in North America and Europe in 1999 and grossed $88.5 million from over a million tickets sold. A Rush of Blood to the Head Tour was the second concert tour by British band Coldplay. The tour was launched in support of the band's second album, A Rush of Blood to the Head (2002). The band had over 150 shows in Europe, the Americas, Asia and Australasia. The tour DVD Coldplay Live 2003 was shot at the Hordern Pavilion in Sydney, Australia on 21 and 22 July 2003. The Madly in Anger with the World Tour was a concert tour by American heavy metal band, Metallica. The tour supported the band's eighth studio album, St. Anger. The tour lasted over 12 months, beginning in the fall of 2003, performing over 100 shows. A New Day... was a Las Vegas concert residency performed by Canadian singer Celine Dion at the 4,000-seat Colosseum at Caesars Palace in Las Vegas. It was created and directed by Franco Dragone and premiered on 25 March 2003. 90-minute event, A New Day... introduced a new form of theatrical entertainment, a fusion of song, performance art, innovative stage craft and state-of-the-art technology. Dion was originally contracted for three years, however, due to its immediate success, the show continued for an additional two years. A New Day... ended on 15 December 2007, after a 5-year run. A New Day ... is the most successful residency of all time, grossing over US$385 million and drawing nearly three million people to 717 shows. The New Jersey Syndicate Tour, Jersey Syndicate Tour, New Jersey Syndicate Brotherhood Tour, or New Jersey Tour, was a concert tour by American hard rock band Bon Jovi that ran from 1988 to 1990. The massive, highly successful world tour was put on in support of the band's 1988 album New Jersey. The Under My Spell Tour was the debut headlining concert tour by American recording artist Paula Abdul. The tour supports her second studio album Spellbound (1991). The tour began in October 1991 and ran for nearly 100 shows in North America, Australasia and Asia. The Slippery When Wet Tour, by American hard rock band Bon Jovi, ran from 1986 to 1987. It supported the band's multi-platinum 1986 album Slippery When Wet and was their first major worldwide tour, visiting places such as Australia and Canada for the first time. The Secrets Tour was the debut concert tour by American pop/R&B singer Toni Braxton. The tour was in support of her multi-platinum album, Secrets. The tour began during the summer of 1996 in theatres. Jazz saxophonist Kenny G joined the tour September 18, 1996. Remaining shows in the U.S. were billed as An Evening with Kenny G & Toni Braxton. Joe Jonas & Jay Sean: Live in Concert was a co-headlining tour by American recording artist Joe Jonas and British recording artist Jay Sean. Predominately visiting North America, the tour played 19 concerts in the fall of 2011. Face to Face 2003 was a concert tour by Elton John and Billy Joel. The pair performed under the Face to Face concert series, which was constantly proving more popular amongst fans. #ShawnsFirstHeadlines is the debut concert tour by Canadian recording artist, Shawn Mendes. The tour supports the singer's EP, The Shawn Mendes EP (2014), and his debut studio album, Handwritten (2015). The tour visited North America and Europe. The Search for Everything World Tour was a concert tour by American recording artist John Mayer in support of his seventh studio album The Search for Everything (2017). The tour played 62 shows and visited the Americas as well as Europe, beginning on March 31, 2017 in Albany, United States, and concluding on October 29, 2017 in Buenos Aires, Argentina. The Ridiculously Self-Indulgent, Ill-Advised Vanity Tour is a concert tour performed by American musician and satirist "Weird Al" Yankovic. The tour supports Yankovic's ninth compilation album, Medium Rarities (2017). Intended to be a more intimate and less stylized production compared to his previous concert tour, the Vanity Tour focuses on Yankovic's older material and original songs. The 76-date North American tour was announced in October 2017, and includes 68 shows in the United States and eight shows in Canada. On June 25, recordings of the entire tour were released on Stitcher Premium. The 5th Annual Honda Civic Tour was a concert tour headlined by the American band Maroon 5. ↑ Fiasco, Lance (February 7, 2003). "Metallica on Tour with 'Motley Crue for the '90s'". idobi Radio . Retrieved February 11, 2018. ↑ Varias, Chris (July 10, 2000). "Hetfield-less Metallica turns concert into karaoke". The Cincinnati Enquirer . Retrieved February 11, 2018. ↑ Saraceno, Christina (December 29, 2000). "Tina Turner the Top Touring Act of 2000". Rolling Stone . Retrieved February 11, 2018. ↑ "2003: Top 100 Tours" (PDF). Pollstar . Fresno, California. January 12, 2004. Retrieved February 11, 2018. ↑ Zahlaway, Jon (June 20, 2000). "Korn To Follow "Sanitarium" With Headline Tour". LiveDaily . Archived from the original on June 25, 2001. Retrieved February 11, 2018. 1 2 3 Augusto, Troy J. (July 18, 2000). "Metallica's Summer Sanitarium Tour". Variety . Retrieved February 11, 2018. 1 2 D'Angelo, Joe (February 5, 2003). "Linkin Park, Limp Bizkit, Metallica To Launch Joint Tour". MTV News access-date=February 11, 2018. Archived from the original on February 19, 2003. 1 2 "METALLICA SUMMER SANITARIUM TOUR 2003 ANNOUNCED". IGN . February 5, 2003. Retrieved February 11, 2018. ↑ "Jul 12 2000 - Denver, CO, United States of America - Mile High Stadium". Metallica Official Website. Blackened Recordings. July 2000. Retrieved February 11, 2018. "Metallica Plans Summer Tour With Korn, Kid Rock". LiveDaily. April 18, 2000. Archived from the original on June 18, 2001. Retrieved February 11, 2018. Zahlaway, Jon (July 26, 2000). "Metallica Set To Play Six Free Make-Up Dates". LiveDaily. Archived from the original on June 25, 2001. Retrieved February 11, 2018. Zahlaway, Jon (February 18, 2003). "Metallica, Limp Bizkit, Linkin Park nail down initial tour dates". LiveDaily. Ticketmaster Entertainment, Inc. Archived from the original on March 17, 2003. Retrieved February 11, 2018. 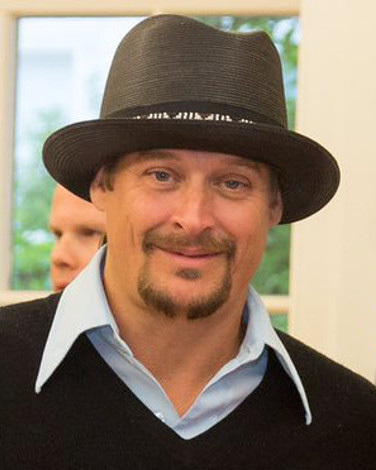 D'Angelo, Joe (February 25, 2003). "More Dates Added To Metallica/Limp Bizkit/Linkin Park Tour". MTV News. MTV Networks. Archived from the original on August 14, 2003. Retrieved February 11, 2018. Keene, Darrin (July 7, 2003). "LIVE: Summer Sanitarium Tour featuring Metallica, Limp Bizkit, Linkin Park, The Deftones and Mudvayne". Chart Attack . Channel Zero . Retrieved February 11, 2018. Prevate, Sylvain (July 18, 2003). "Metallica est en ville" [Metallica is in town]. Le Journal de Montréal (in French). Quebecor . Retrieved February 11, 2018. ↑ Basham, David (May 4, 2000). "Metallica, Dre, Kid Rock, No Doubt To Play EMP Opening". MTV News . Archived from the original on June 19, 2000. Retrieved February 11, 2018. ↑ Van Horn, Teri (July 20, 2000). "'MYSTERY BAND' METALLICA PLAY BLIND DATE". MTV News. Retrieved February 11, 2018. ↑ Powers, Ann (July 22, 2000). "ROCK REVIEW; Outsiders Venting Their Inner Darkness". The New York Times . Retrieved February 11, 2018. ↑ Kot, Greg (May 8, 2000). "Metallica To Headline Rockfest 2000". Chicago Tribune . Retrieved February 11, 2018. 1 2 3 4 5 6 7 8 9 "Amusement Business Boxscore: Top 10 Concert Grosses". Billboard. Nashville, Tennessee. 112 (32): 18. August 5, 2000. ISSN 0006-2510 . Retrieved February 11, 2018. ↑ "Amusement Business Boxscore: Top 10 Concert Grosses". Billboard. Nashville, Tennessee. 112 (30): 14. July 22, 2000. ISSN 0006-2510 . Retrieved February 11, 2018. 1 2 3 "2003: Top 200 Concert Grosses" (PDF). Pollstar. Fresno, California. January 12, 2004. Retrieved February 11, 2018. ↑ "Billboard Boxscore: Concert Grosses". Billboard. Nashville, Tennessee. 115 (37): 24. September 6, 2003. ISSN 0006-2510 . Retrieved February 11, 2018. ↑ "Billboard Boxscore: Concert Grosses". Billboard. Nashville, Tennessee. 115 (30): 18. July 26, 2003. ISSN 0006-2510 . Retrieved February 11, 2018. 1 2 "Billboard Boxscore: Concert Grosses". Billboard. Nashville, Tennessee. 115 (31): 22. August 2, 2003. ISSN 0006-2510 . Retrieved February 11, 2018. 1 2 3 4 5 6 "Billboard Boxscore: Concert Grosses". Billboard. Nashville, Tennessee. 115 (32): 44. August 9, 2003. ISSN 0006-2510 . Retrieved February 11, 2018. ↑ "Billboard Boxscore: Concert Grosses". Billboard. Nashville, Tennessee. 115 (33): 21. August 16, 2003. ISSN 0006-2510 . Retrieved February 11, 2018.